Our house beers are Uber Brew from Old Dairy Brewery, and Rother Valley Brewing’s Level Best and Three Legs Dark. 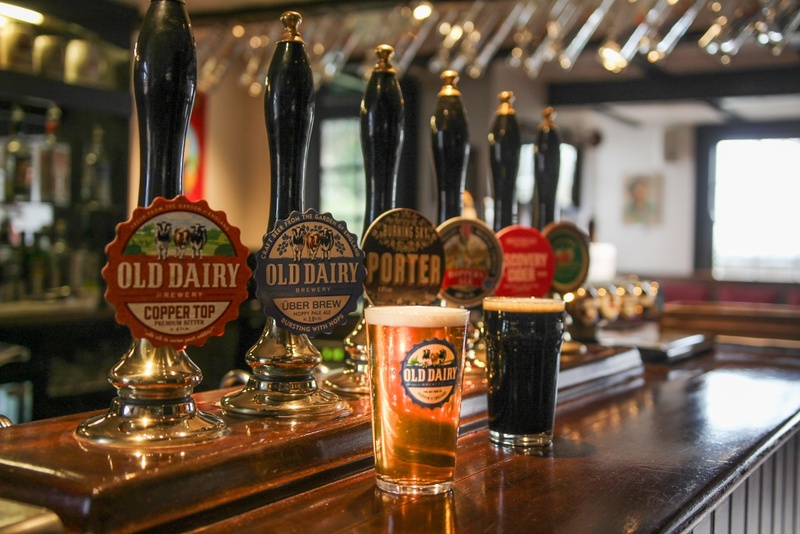 All three are brewed within a few miles of the pub. We also offer one or two guest beers from other breweries we like. Beautiful cider from Nightingale – just 9 miles from us – is on tap. They grow all their own apples and pears on the farm and use only traditional methods, so it’s the real deal. For lovers of real lager, on tap we present the tremendous Röthaus Pils from the Black Forest in Baden-Württemberg and Oechsner Vier from Bavaria. Finally, we have three dedicated craft keg taps, serving exciting beers from the UK and abroad. At the time of writing, we’re serving Marley’s Stout from Brewing Brothers in Hastings, WORK IPA from Forest Road Brewing in London and Three Legs Session IPA from our friends up the road.